Fancy getting your images seen by a global audience, plus being in with a chance of winning some top camera gear? Those are the benefits of taking part in the regular photo challenges held on the GuruShots website. We recently partnered up with GuruShots to hold a ‘Give it your best shot!’ challenge. Over 38 million votes were cast by GuruShots members, and here are the winners. Dimitrij Modic from Slovenia. Here’s his ‘At sunrise’ image. The Digital Camera World Editor's pick was Steffen Johnsen's ‘Golden eagle portrait’. The golden eagle is the second-largest bird in Steffen's native Norway, and is one of the best-known birds of prey in the northern hemisphere. 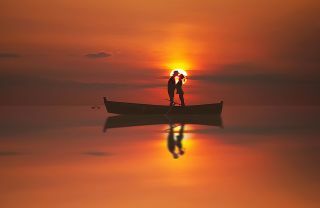 Best photo went to Alfred Krivickas from Lithuania, for ‘First kiss’, while Dimitrij Modic from Slovenia was voted Best photographer in the challenge, for his ‘At sunrise’ image. The winner of Guru's top pick went to 'Marvin Marverick - Malaysia', although it's unclear whether this was the title of the photo, or Marvin's country of origin. So what it GuruShots, and how does it work? Billed as the world’s leading photo game, GuruShots is an online platform conceived to give global exposure to people who love taking photographs. GuruShots members start out as Newbies and compete with other photographers to win challenges, increase their ranking on the site and eventually progress to coveted ‘Guru’ status. Challenges are voted on by Gurus and the wider GuruShots community, and there’s a fresh challenge – like this ‘Give it your best shot!’ – every day.